THE DORM THAT DRIPPED BLOOD: Let’s Put On A (Horror) Show – Schlockmania! To embrace the slasher genre of horror is to admit you have an appreciation for the simpler things. This much-vilified but oddly resilient style of horror film has an enduring appeal to many fans because it presents genre at its simplest, a kind of cinematic junk food that strips away ambitious themes and narrative intricacy to create a minimalist set of suspense mechanics. In other words, the slasher movie ain’t pretty and it ain’t good for you – but if it’s done well, it can be satisfying on a primal level. The Dorm That Dripped Blood – alias Pranks – fits that “cinematic junk food” bill nicely, eschewing complexity to just concentrate on the stalking and slashing. The plot deals with a handful of students who stay behind at campus during the Christmas holiday to break down a co-op dormitory that is being closed. Joanne (Laurie Lapinski) is the nominal leader and likely “final girl” of the bunch, Brian (David Snow) is the hunky guy who shows interest in Joanne, Patti (Pamela Holland) is the high-strung member of the gang and Craig (Stephen Sachs) is the impulsive jokester. Unfortunately for this quartet, they are in danger and they don’t even know it: a mystery killer has bumped off a few peripheral characters already and decides to focus on the dorm-cleaning heroes. They also have to contend with creepy student John Hemmit (Woody Roll), a dorm-dweller who refuses to abdicate his room and who also seems like the most likely suspect. Plenty of stalking and a little slashing follows, plus there’s a twist ending that really goes for the gusto. 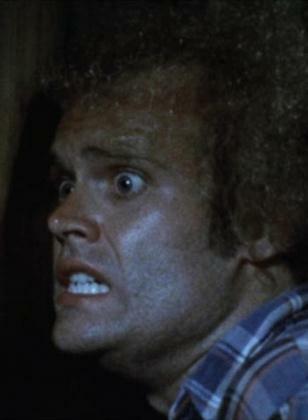 If viewed through critical eyes, The Dorm That Dripped Blood is little more than an exercise in slasher tropes. The storyline borrows heavily from a variety of archetypes for this subgenre – Halloween, Friday The 13th and Black Christmas, to name a few – and the plotting cheats in places by allowing the killer to get around with implausible speed. The characterizations are all pretty stock, with each character defined by one main characteristic, and there are so few of them that you’ll probably guess who the killer is at least twenty minutes before the reveal. However, when The Dorm That Dripped Blood gets down to business, it totally delivers the blood-spurting goods. Co-writers/directors Jeff Obrow and Stephen Carpenter really invest themselves in the setpieces – Carpenter also shot the film and Obrow did the editing – and they manage some very effective moments. Highlights in this area include a breathtakingly cruel and energetic kill that closes the first act and another grim murder scene later on that involves an electric drill. These moments are aided by gore effects by Matthew Mungle that are unusually good for such a shoestring venture and add nice gruesome “exclamation points” to each setpiece. 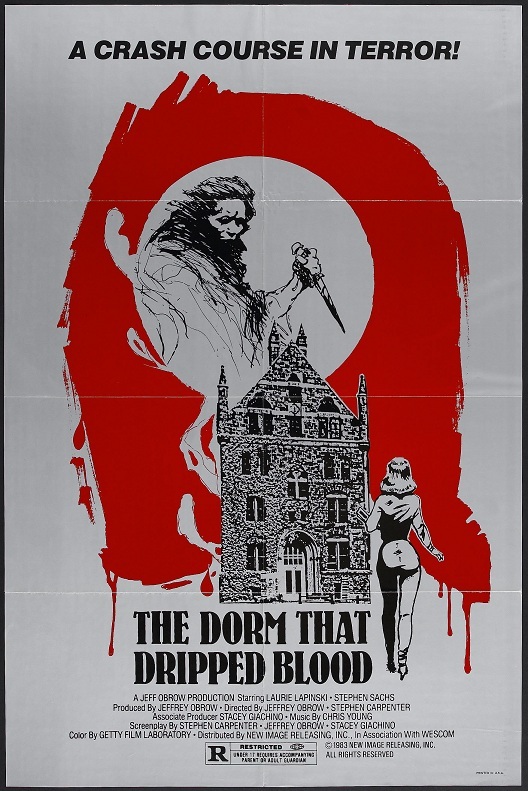 It’s also worth mentioning that The Dorm That Dripped Blood is steeped in a certain “vibe” that a certain type of horror fan develops a craving for if they see enough vintage slasher fare. The use of real campus locations, including a genuine, convincingly dreary co-op dorm building, gives the film a distinctive atmosphere. It also helps that Carpenter’s cinematography has a grungy stylishness and Christopher Young’s Herrmann-derived score replaces the expected synthesizers with good, old-fashioned shrieking violins. The early-1980’s look of the world depicted in the film add that final dollop of period charm (particularly the unisex shag haircuts our protagonists favor). In short, The Dorm That Dripped Blood might not hit the classic heights of a Halloween or a Black Christmas but it gets the job the done with enthusiasm and a crude but charming “let’s put on a show” sense of flair. If you go for slasher flicks, its the kind of cine-junk food that will hit that sweet spot.